. Published on November 21, 2014 . Cariloha has been a proud sponsor of Miles 2 Give, a passionate organization of philanthropist runners who have dedicated their lives to finding a cure to Sarcoma cancer. This year, the organization is fundraising their efforts for research through the Huntsman Cancer Institute as they physically run and tour 10,000 miles around the United States wearing our Cariloha Bamboo fitness gear. They started running counter-clockwise from Times Square, New York City in May to return back to Times Square in December. At the moment, they’re in Galveston, Texas. All money raised on their tour goes directly to Sarcoma cancer research. So many individuals make this movement a reality, and Cariloha is honored to be a proud sponsor of Miles 2 Give’s pursuit to give and inspire. Landon Cooper, Miles 2 Give founder, uses several tools to take on this 10,000-mile journey. Every day is a different journey with its own struggles and blessings. We recently had the opportunity to interview Landon to showcase the 2014 Miles 2 Give tour. What are your team’s daily inspirations? What keeps you moving? Running, art, and family. All of it comes down to a peaceful and comfortable approach to the universal pursuit, which is to give and inspire. It’s simply a reflection of us and the human race. It’s the reflection of the spirit of a warrior and the reflection of us as a hungry and passionate human race. The responsibility to be a part of that movement of inspiration is something that we feel with the deepest parallel of Cariloha. We have many more miles to go and Cariloha is helping us make that possible. What inspired the birth of Miles 2 Give? I’ve been a runner for 28 years. I was involved with soccer and competitive running when I was younger. I was euphorically running in my corporate life. In 2009, a friend of mine was diagnosed with a rare form of cancer (Sarcoma) which triggered a waterfall of serendipitous events to bring me to create a platform of connectivity, peace, love, and transparency for the warriors and families worldwide. Ever since the unity of Cariloha and Miles 2 Give in 2012, it has been amazing to be part of an organic evolution of a 5-miles-per-hour billboard of awareness and inspiration. It’s a beautiful feeling. What drives your passion for long-distance running? I’ve come a long way. 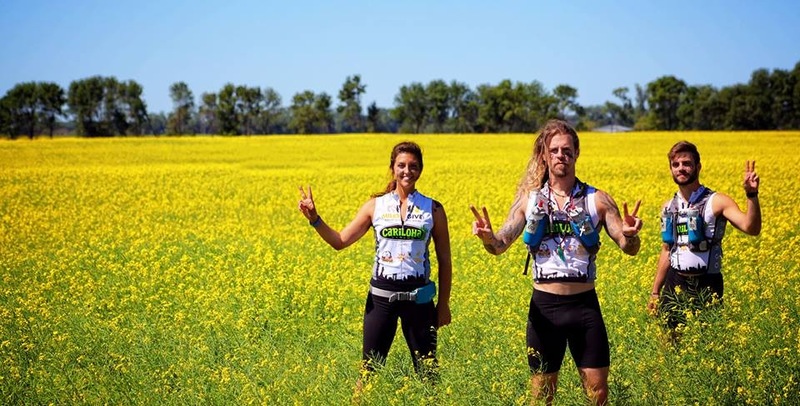 After last year’s run across the country, I was overcome with the responsibility to provide layers of inspiration for any warrior, or victim of cancer. Love drives my passion for this movement. The running side is just secondary. What is primary is the rolling museum of connectivity and Life Elevated (THE RV) and promoting everyone who makes the tour possible and highlighting the families that we do run into. My main passion is to make people realize that they’re not alone on this battle with cancer. What are your primary goals for Miles 2 Give’s 2014 tour? We’re trying to bring positive movement to a dark subject. We’re trying to focus on the reflection of the families. We hope to inspire a more positive attitude in knowing that these warriors are not alone. Whether we are on the RV, or out on a run, there is some similarity that they get from us. When we go through the unknown, we don’t give up. When a warrior sees that, they have some relativity that they can connect with. After this run, what is next for Miles 2 Give? When we finish, I would love to present a nice check to Huntsman Cancer Institute for research for less toxic treatment options. We also hope to inspire in more ways than just running around the United States and meeting with warriors. We hope to provide more healing forms of art. Whether it be yoga, meditation, painting, or poetry, we want to inspire a more infinite inspiring atmosphere. Landon Cooper and the entire Miles 2 Give team are inspiring in more ways than they know. To get involved, or follow their journey, you can find more information on their blog, Facebook, Twitter, or Instagram.